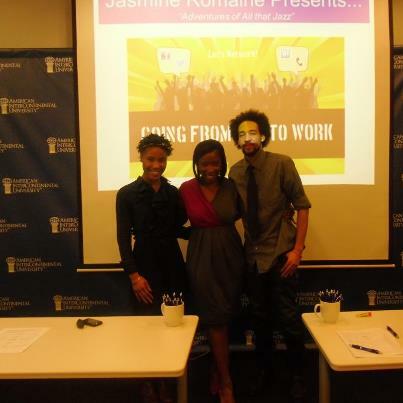 Jasmine Romaine presents, “Adventures of All that Jazz” took place, Saturday, February 16, at the American InterContinental University Success Center in Chicago, Ill. A workshop tailored to coach professionals how to enhance their own adventure in “Going from NET to WORK”. The workshop gave an opportunity for attendees to learn strategies, but also empower themselves. “It was a confidence boost! Made me reflect on my strengths and acknowledge some weaknesses while giving me good practice networking. It exceeded my expectations,” expressed Christina Verdos, a graduate student at DePaul University who participated in the workshop. “The host had great energy and was easy to connect with,” Verdos added. The inaugural workshop took place in New York. Stay tuned for more adventures with All that Jazz! Posted on February 24, 2013, in Chicago, Education, Empowerment and tagged adventures of all that jazz, American InterContinental University, career path, Charnika Webster, Chicago, community service, Dior B. Sharp, empowerment, Going from Net to Work, harnika Webster Photography, Jasmine Romaine, Laugh Factory Chicago, leadership, Motivation, Signature Films. Bookmark the permalink. 2 Comments.